The name Leiden, the name of the city in die Niederlande where Alex and I spent the second weekend in März (11. bis 14. März) is different between Dutch and Deutsch for two big reasons: (1) Leiden is pronounced LEE-den in Dutch but LIE-den in Deutsch; (2) the name Leiden in Dutch is said to come from an old Germanic word for "canal", but today, the word leiden in Deutsch means "to suffer". Not exactly a welcoming name for someone living in a German-speaking city. Luckily, staying in Leiden invoked no suffering (except for some discomfort from extensive walking while eight-months-pregnant). 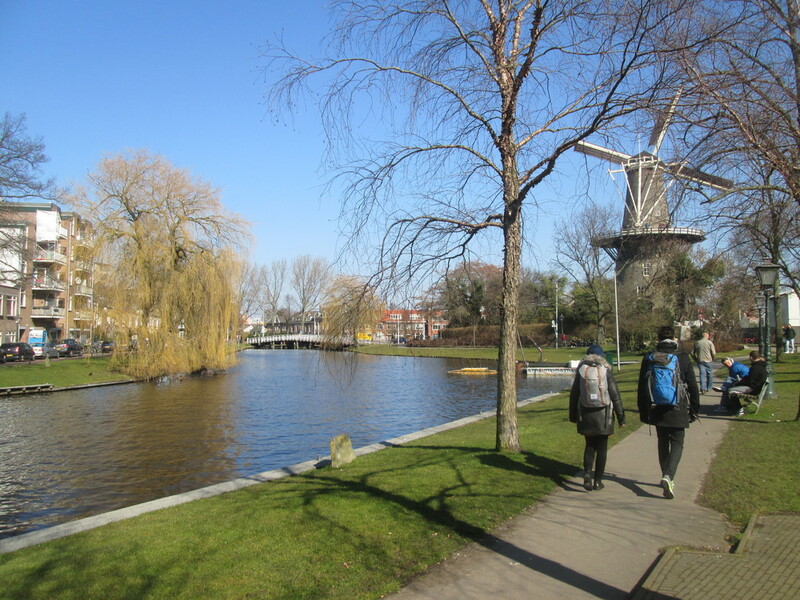 Rather, everything—including the train ride there, a visit to Den Haag (The Hague), and touring eine Windmühle—was quite refreshing and fun, especially with the beautiful weather. Leiden is situated between Amsterdam (the capital of die Niederlande) and Den Haag (home to the seat of goverment). Traveling there from Köln took a little over three hours mit dem Zug, including a change of train. Crossing the border into die Niederlande couldn't have been more obvious. The landscape suddenly became flooded with small canals and old windmills off in the distance; had we gone later in Frühling, I am almost certain we would have been greeted by fields of Tulpen. On Samstag, we ventured to Den Haag, which is a 35-minute train ride southwest of Leiden. There, we walked through a large park just outside the Den Haag Centraal train station. There was an abundance of birds of various species swimming in the small reservoir into which one of the city's many canals emptied. Across the reservoir and canal was the Koekamp—a fenced-in area home to numerous deer. After admiring the deer grazing on the crisp spring morning, Alex and I wandered by canals and through parks in search of a place to eat. Unlike in the States, where many restaurants open at 10:00 or 11:00 in the morning, European restaurants (at least the ones I've encountered) typically don't start serving lunch until noon. While finding a bite to eat after an early start was frustrating, wandering through Den Haag gave us plenty of time to see some of the quieter parts of the city before finding a crowded hotel restaurant-cafe. After circling quiet, cobbled streets lined with yet-to-open shops and restaurants, we finally happened upon a busy shopping district where we found 't Goude Hooft. After taking a quick glance at the menu, we were pleased to see small English translations under descriptions for various items of Dutch cuisine, pasta, and sandwiches. Sitting outside in the bright sun in comfortable 12°C (54°F, which after weeks of 3°C or 37°F feels great), we happily enjoyed an assortment of small sandwiches and "Dutch 12 o'clock"—a platter of tomato soup, an egg salad sandwich, "traditional Dutch snack" (basically a deep fried mashed potato log on a roll with mustard... delicious), and Russian salad (which was either a small green salad or a small potato/egg/something-else salad... we couldn't figure out this last part). Am Sonntag, we spent the entire day in Leiden. We started our day with brunch at Café-restaurant De Bruine Boon—a small café on the canal Rijnsburgersingel that encircles the center of the city. There, I enjoyed tomato soup paired with a ham and cheese sandwiches (a monthlong craving of mine finally satisfied!) while Alex enjoyed a Dutch favorite: apple pancake. This was unlike any pancake I had ever seen. The taste of the pancake was more like that of a crepe, topped with cinnamon and baked apple slices, and the size of it was huge—it had to be larger than 14 inches in diameter! The Rijnsburgersingel; just to the right of the crooked tree in the center of the photograph, you can see the building that houses De Bruine Boon, where we enjoyed brunch. After energizing ourselves with delicious food, Alex and I walked along the Rijnsburgersingel, where we found ourselves in the shadow of De Valk (Dutch for The Falcon). De Valk dates back to 1743, succeeding a wooden mill that was onsite beginning in 1667. The newer mill, made of stone, housed two families and was built high enough to catch the wind above the surrounding houses. Above the living accommodations, the mill was used for milling, mostly flour. The various floors of the windmill (which you can read about on the website of the Molenmuseum De Valk) are connected by steep wooden ladders. All parts of the mill are accessible to the public, except the cap loft, which is full of moving parts that translate the rotations of the windmill blades to the milling machinery as well as houses the mechanisms required for the cap to turn and catch the best winds. After visiting De Valk, Alex and I ventured to the grocery store (which was actually open on a Sunday!!!) to grab some snacks for the room. We picked out a Dutch specialty: thin, circular waffles filled with honey. While they are delicious straight out of the package, they are even better warmed up when the honey is just melted. Despite them being sugary and sticky, the treat doesn't stick to your teeth, making the experience even better. While climbing the steep ladders was quite exhausting at 8-months pregnant, I am happy to report that our trip to Leiden did not invoke any suffering. Rather, it was a peaceful and relaxing weekend exploring what makes the Netherlands so idyllic.